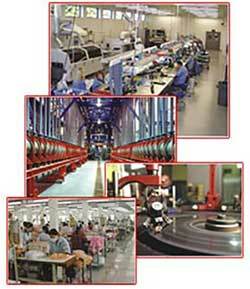 The manufacturing industry constantly experiences economic and competitive challenges. In comparisons to today’s market structure companies are required to operate more efficiently at the same time with the reduction of costs. At present, utilization of the technology in order to achieve affectivity is definitely not advanced but it is an integrated document management (IDM) soft ware which has distinctively been looked as magnificent. The availability of security options are found in variety such as taken for example the utilization of surveillance is not only helpful for security and safety but also it supports in increasing the productivity, monitor and assist in servicing of equipments, training and the workflow of the management. However, the environment of manufacturing and Industry location consists of distinctive challenges for surveillance. Time-consuming distances, insensitive environments and tight budgets. Capable IP cameras are the most applicable ones for the suitability of surveillance. This can be utilized wirelessly and with the structured cabling excluding the need for individual cabling sole camera. Integration of the cameras can be done with the support of the fitted sensors and safety devices. Variable are found in the category of rugged housings to resist vapors, dust and debris. In a manufacturing organization there is a need for a wireless network which can give consistent coverage inside and outside the business. It can be made to adjust to the unique physical challenges and hard-to-wire locations of a manufacturing plant. Plethora of machinery and devices are possessed by the manufacturing plants which needs network connectivity. Wireless vendors are required to give cost effective solutions which can facilitate legacy machinery and robots. At present structure of the global economy it is really very tough to maintain high productivity in order to remain in the competitive world. Suraj Informatics therefore provides unparalleled investment coverage by transferring the solution that assists cost-effective, non-disruptive migration of arising and improvised technologies.